St Louis Florist Wedding Tips, Warrenton, Mo. Missouri, Wedding St Louis, Mo. Flowers are one of the most important aspects of your wedding day. They set the mood and tone for the entire event and will be remembered for years to come. Many florist can accept only a limited number of weddings on a given day, so it is important to contact your florist well in advance to begin planning. A good rule of thumb is to contact your florist at least three months in advance. However, if your wedding is going to be an exceptionally large event, take place during peak wedding season or fall on a holiday, then six months to a year is not to soon to contact your florist. Your florist will work within your wedding budget, so be honest about your budget on the initial consultation so the florist will know what to recommend. By taking your budget into consideration from the very beginning of the planning process, the florist can give you the best advice on how to place the flowers for maximum effect and what types of flowers will be the best value to achieve your desired look and feel. Besides suggesting specific types of flowers that will work within your budget, a professional florist can offer helpful suggestions as to what flowers might be used at both the ceremony and reception. Florist are overflowing with creative ways to make use of your wedding budget and flowers wisely. 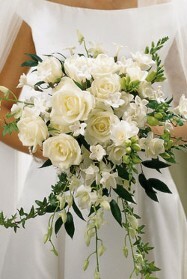 Be sure to tell the florist that you are gathering estimates rather than making an appointment for a consultation. Be prepared with a detail list of your floral needs. The florist will be able to give you a rough estimate without a lengthy meeting. If you are gathering ideas and then comparisons, it is best to inform the florist of your intentions. Floral Designers are trained and highly skilled floral artist. Their ideas have value. You may be asked to pay a consultation fee if you want to discuss a florist's actual ideas for your wedding. 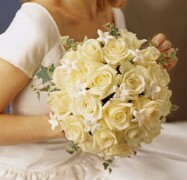 In most cases, the fee will be waived or applied to the order once the order is placed with the florist. The more information you can provide the better your florist will be prepared to offer creative suggestions. Your florist will want to create a spectacular and memorable event for you. Anything you can bring will be beneficial. Pictures that depict what you have in mind are extremely helpful. Bring a photo of your dress and a sample of the fabric or lace if you have it, as well as swatches and photos of the bridesmaids' dresses. Also think about what "style" of wedding you want. If you are not sure, your florist can offer suggestions based on your wedding plans so far.